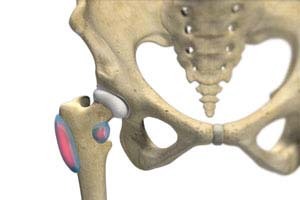 Tenderness and swelling in the area of pain over the bursa during the physical examination of the hip confirms the diagnosis of hip bursitis. To check for any bone spurs that could be causing irritation of the bursa Dr. Patel may order an X-ray. If the reason for the pain is not very clear the doctor may order an MRI to view the soft tissues and structures not visible on X-ray. Treatment goals for bursitis are focused on resolving the inflammation and pain. Rest is advised and activities causing the bursitis pain are restricted. Anti-inflammatory medications are prescribed to reduce the inflammation and pain. Physical therapy and treatments with heat, ice and ultrasound sometimes are recommended. An injection of corticosteroid medicine may be administered to reduce the inflammation. Sometimes a second injection is necessary if the pain returns after a few months. These nonsurgical treatments provide relief from hip bursitis in the majority of cases. Sometimes, however, Dr. Patel may recommend surgical removal of the bursa if you do not respond to conservative treatment measures.